I've seen lots of articles on simulated reality recently. Supposing for a bit that this is a sensible hypothesis to entertain and not just a science fictional conceit, what might be the consequences of supposing that such a 'reality' is running on a machine with lazy evaluation? If your task were to simulate a universe well enough for its inhabitants to be convinced it was seamless, then there is an obvious optimisation that could be made. You could simulate just those parts that could be perceived by the inhabitants. But the catch is that if an inhabitant were to explore a new region, the simulation would be required to fill in that region. Just creating a blank new area wouldn't do, it's current state would need to be consistent with having had a plausible history and so the simulation would be required to fill in not just its current state, but also its past. This is precisely what is provided by lazy evaluation - demand driven evaluation that takes place only when results are observed. It seems natural that such a simulation should make use of laziness. But such optimisation doesn't need to be limited to lazily computing 'new regions' where by 'region' we mean a spatially localised volume. We could also imagine implementing level of detail. If we don't look closely at an object in our grasp, there's no need to compute every single detail of it. We need only provide detail at the resolution at which it can be perceived. We'd like this built into every aspect of the simulation so that anything within it is computed only to a desired accuracy. I've spoken a few times about such a data structure in posts like this. This is precisely what the real numbers give us. Computationally, a real number is an object which when given a degree of accuracy, returns a rational number (or some other finitely manipulatable structure) that represents the real to this accuracy. The wikipedia article suggests that 'the use of continua in physics constitutes a possible argument against the simulation of a physical universe'. This is diametrically opposed to what I might argue: in fact the presence of continua suggests the existence of an efficient demand driven simulation with level of detail. The problem is that the people who have been thinking about these issues have been thinking in terms of traditional imperative style programming where a real number is typically represented to some fixed finite precision. But in fact there are infinitely many real numbers that can be represented exactly if we think in terms of lazy data structures. But this is all idle speculation if we don't make predictions. So here is one. In a computer simulated universe, all physics must obviously be computable. But all computable functions are continuous. So in a simulated universe we'd expect the physical laws involving real numbers to make use of them only in a continuous way. Sound familiar? The next section is an aside and I need to give a spoiler alert as I'll be mentioning some aspects of Greg Egan's Permutation City. What exactly what is meant by 'demand driven' above? If we have implemented a simulated universe I expect we would be interested in looking in on it from time to time. So this is what is usually meant by 'demand'. Whenever the program performs I/O to show us what is going on, it would trigger the evaluation of the lazy thunks that had been sitting around. But consider how the universe might appear to its inhabitants. Whether or not we look in on it us surely irrelevant to the inhabitants, assuming we just look and don't try to communicate. But if I/O isn't performed, functional programmers don't make much of a distinction between an unevaluated thunk and an evaluated one. They are observationally equivalent. So do we in fact need to run the simulation for its inhabitants to consider themselves to exist? Anyway, I won't say anything more about this because Permutation City deals with this issue at length. I'm just rephrasing it as a lazy evaluation issue. My next post will be on life in a monadic universe. Update: I'm going to add some detail to the above. Suppose we represent real numbers as infinite sequences of digits. Suppose also that we have some module in a simulation that, let's say, resolves collisions between particles. You might ask it "what is the velocity, to 20 digits, of particle A after the collision". It must then look at all of the relevant inputs, decide how accurately it needs them, and then propagate new requests. For example it might work like this "if I need the velocity of A to 20 digits I need the mass of particle B to 25 digits and the velocity of particle C to 26 digits..." and so on. The idea of demand driven modules that produce outputs to a given accuracy by making requests of their inputs to a given accuracy exactly parallels the subject of analysis in mathematics. There you ask questions like "if I need to know f(x,y) with an error of no more than δ, what ε of error can I tolerate in x and y?". Functions that allow this kind of analysis are precisely the continuous ones. In other words, a simulated universe that is built from continuous functions lends itself to a demand driven implementation. One might argue that the whole of the fields of analysis (and topology) are the study of functions that can be evaluated in this way. And of course, in our universe, the functions we study in physics are typically the continuous functions. So contrary to the claim that the existence of continua argues against the idea that the universe is a simulation, I'd like to point out that they might actually make it more convenient to simulate our universe. In fact, we use this fact all the time in ordinary everyday physics simulations because we know we only need to work to a certain level of accuracy to get accurate results. The claim that this universe can be simulated, and the claim that this universe is a simulation, are philosophical claims that I don't like to waste time on. But the claim that the existence of continua blocks the notion that the universe is a simulation is a fairly precise statement of logic, mathematics and physics. I claim it is wrong, and that's the only claim I'm making here. I find it amazing the way you can take a bunch of abstract nonsense and turn it into concrete Haskell code for doing something mundane. Having down-to-earth examples really does help with getting your head around the abstractions. Anyway, on page 43 of Categories for the Working Mathematician (2nd Ed.) is the 'interchange law' for horizontal and vertical composition of natural transformations. Not only can we find a nice mundane example to help thinking about it, we can even test it using Quickcheck. Where f and g are intended to be instances of Functor. If we have a natural transformation from f to g, and another from g to h, then we can compose them using the ordinary Haskell composition operator (.). In Haskell, functors are frequently containers, so we can use containers as a guiding example. If we know how to map a bag of stuff to a sack of stuff, and we know how to map a sack of stuff to a box of stuff, then we just perform the two operations in sequence and we can map a bag of stuff to a box of stuff. This is known as vertical composition. Just type test1 in ghci to hear the sweet sound of 100 tests passing. Anyway, we're just a hair's breadth away from defining 2-categories now. But I'll leave that for another day. Well that's enough abstract nonsense. Time to get away from it all and watch some youtube videos. Eh? Oh well. Just wish me luck for tomorrow when I try to beat my fastest time in Bay to Breakers. Maybe some other bayfpers will be there too. desingularise 'perturbs' the value of its argument infinitesimally so that when we pass in an argument of zero we end up evaluating our function not at zero, but somewhere infinitesimally close. So our division by zero becomes division of infinitesimals and the above definition comes into play. The first clause of the definition can also be viewed as an application of l'Hôpital's rule. Anyway, the fact that it doesn't work for all functions doesn't detract from the fact that it's a pretty approach from solving the problem when you have a fairly well behaved singularity. I've not actually seen anyone else use dual numbers to smooth over singularities in this way, but a few years ago I did come across something very closely related that apparently caused a little controversy in the computational geometry world. Suppose you want to determine whether or not a point lies within a possibly non-convex and arbitrarily complicated polygon. One algorithm is this: follow a line in any direction from the point to infinity (though just outside the bounding box of the polygon would do) and count how many times you cross the boundary of the polygon. If you count an odd number of crossings you're in the polygon, otherwise you're outside. It's beautifully simple and if nobody had thought of it before it'd be worthy of publication. But like the methods described in many computational geometry papers I've read, this one often fails in practice. There are at least two sources of difficulty. Firstly, computational geometry algorithms are subject to numerical errors. You often find yourself having to decide whether or not a point is on one side or another of a line, say, and getting inconsistent results because two different ways of computing the same thing result in different decisions being made because of rounding. That can be fixed by using something like arbitrary precision rational arithmetic. But even if you do this, there is still a problem. 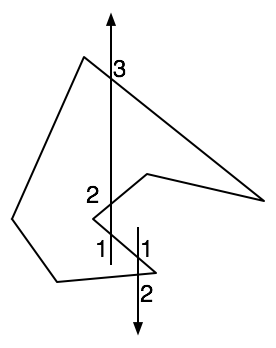 When you follow a line from the point you're testing you may find that it doesn't simply cross one of the sides of the polygon, it may travel precisely through a vertex. If your code isn't written carefully you may accidentally count that as zero, one or two crossings. It's easy to write sloppy code that gets it right most of the time, but it's hard to work out every possible case where some kind of degeneracy might happen. What happens if the outward ray is actually collinear with a polygon face? Do vertex intersections and collinearities cover everything? Back in '94 Edelsbrunner and M√ºcke came up with the idea of deforming the geometry infinitesimally, giving their method the utterly bizarre name "Simulation of Simplicity". I think it took people a while to realise that they were actually doing the same thing as people doing automatic differentiation and so the whole notion of an infinitesimal perturbation left people wondering what in fact they were doing. More seriously was this: writing robust computational geometry code that catches all of the degenerate cases is hard. How is it that such a simple algorithm could be slotted into a sloppily written polymorphic algorithm and turn into a watertight one? Was everyone in computational geometry going to be put out of work? Luckily for the computational geometers it still takes quite a bit of work to get the details exactly right, and even when you do, the result isn't necessarily an efficient solution to the problem. I know that when I had a messy computational geometry problem to solve when I was working on MI:2 I just wrote code that turned a blind eye to degeneracies and aggressively pruned away anything that looked suspicious: like near zero length lines and near zero area faces. If a stray pixel poked through somewhere that it shouldn't, and tweaking the tolerance didn't fix it, an artist found a way to hide it. Sometimes beauty and elegance come second place to getting the job done on time. There's a fundamental difference between them. In some sense f "makes use" of the fact that we're applying functions to integers, but even though g is acting on integers, it's not using the fact that we're acting on integers. But this is a vague idea. How can we make it precise? What does it mean to say that h doesn't use specific facts about its arguments? It clearly doesn't mean that h doesn't depend on its arguments because the right hand side clearly depends on a and b. We need to say that the right hand side depends on the arguments, but that it somehow doesn't make specific use of them. 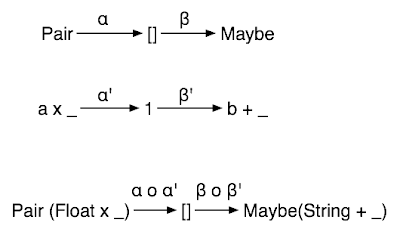 Note that we've made use of the functions (a,b) -> (k(a),k(b)) and (a,b,c) -> (k(a),k(b),k(c)) to implement the idea of applying the same substitution to each of the elements. We might want to work with a wide variety of mathematical 'containers' like tuples and sequences as well as more abstract objects. Can we generalise to all of these in one go? Note that there's nothing set-specific about this, it's a statement that could hold in any category. And there we have it. Starting with the idea of a function that doesn't 'peek inside' its arguments, we're led inexorably to the idea of substitutability of arguments and from there to a categorical definition of a natural transformation. As the definition has been generalised from Set to any category you can have fun unpacking the definition again in other categories. For Set-like categories with functions as morphisms you'll often find that natural transformations are still functions that don't make too many assumptions about their arguments, but in each case the rule about what exactly constitutes 'too many assumptions' will be different. The category of vector spaces is a good place to start. One last point: Category theory was more or less invented for natural transformations. And it's curious how it fits so nicely with the idea of abstraction in computer science, ie. the idea of a function that is limited to using a particular interface on an object. One interesting result relating to natural transformations is the Yoneda lemma. Note also that the Theorems for Free are also largely about similar kinds of substitutions on function arguments.